Getting the right pool of talent on board is essential for any company. However, start-ups and new business ventures, in particular, cannot afford to make any hiring and recruitment mistakes. When the budget is tight and brand credibility has yet to be made, even a single wrong hiring can not only set your business back but also keep it from taking off altogether. Moreover, the scarcity of resources and lack of recognition can make it too hard for you to attract the brightest and best start-up talent. Below, we have compiled seven great tips for building your ideal start-up workforce. Attracting top talent begins with initiating a business based on an innovative idea that others want to be a part of. Everything else, including the location of your business, is secondary. When your venture is an exciting one, potential talent will certainly want to work for you. In addition, your employees will share with their friends and loved ones the awesome experience they have in your company. Thereby, many other potential candidates will approach to work for you. Consequently, you will eventually have the best start-up talent. Although a person may have good experience in several different fields, one cannot be an expert in everything. Thus, you require a team of experts who are top in their individual fields, whether it is sales, marketing or development. Always remember that talent attracts talent. Thus, begin your business by picking great start-up talent who will eventually bring in many other well-versed professionals to your company. Every new hire you choose renders a profound impact on your team’s norms and culture, particularly for small teams. Consequently, buy-in from your start-up team is simply imperative for each hire. You should build team buy-in in two essential ways: First, have each team member of your start-up meet a potential candidate at the final interview stage in order to do an assessment of cultural fit. Once they meet, ask your present employee one very simple question: Will you efficiently and happily spend twelve hours a day with that person? Second, ask others in the field: Would you desire this candidate to be your supervisor or boss? If others do rely on the knowledge and dedication of an expected potential teammate, then such a start-up talent would be the right hire. The quick evolution of a growing company’s needs is one of the toughest aspects of start-up recruitment. It can potentially leave your team members behind when their skills become obsolete. Therefore, every start-up enthusiast should be well-prepared for this challenge ahead of time. You should completely disclose present expectations for the job vacancy being filled and the way it may change, based on your company evolution. Being transparent about your potential business shifts and needs not only encourages your motivated employees to improve their skills continuously but also helps them determine how their efforts can best serve your business mission. To effectively lure, recruit and retain the best start-up talent, you should offer real and measurable benefits. Employee equity (or ownership) is a powerful benefit that aligns the founder and employee incentives and can potentially beat lower paychecks than competitors. Even simple, budget-friendly benefits like food and/or technology allocations can also help attract great start-up talent. Employee healthcare benefits are another vital competitive benefit. There are several different ways of carrying out these strategies. Whatever approach you adopt, it is necessary to define a process clearly and accompany someone on point to both manage it and commit to it. Remember, the process that you define should not change, even when your business grows. The things that seem obvious when you are small naturally tend to get discarded when you grow. The incredible things that guide you to recruit and retain the best start-up talent should continue long after the job contract is first signed. 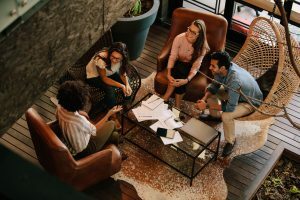 Prioritizing your team’s expectations is valuable to keep your employees motivated and enthusiastic, which can turn even a mundane business into a thriving venture.